Super Mario 63 (abbreviated as SM63) is a great action and platformer game that was developed by Runouw and his team in 2009. 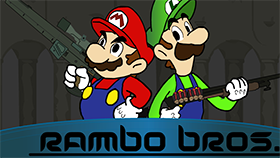 This is a fan game and inspired by the popular game Super Mario 64, Super Mario Sunshine, and Super Mario Galaxy of Nintendo. If you have played through the Mario games, I believe you will like Super Mario 63 because it is very interesting. In this game, your task is to explore the Mushroom Kingdom, overcome the obstacles along the way and get to the destination safely. There will be lots of levels and features in this game and some of them are based on its original and other games of Nintendo. However, there are also lots of levels and features are completely original. With addictive gameplay, this game was rapidly well received and adored by millions of players from all around the world. As mentioned above, your main mission in this game is to explore the Mushroom Kingdom. 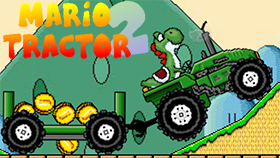 In detail, you will control Mario and overcome all the obstacles on your way. There will be signs consisting of useful information to help you on this journey. At each stage there are many signs and you have to read all of them. You will also see familiar enemies, such as Goomba, Koopa, bomb monsters etc. You can jump on Goomba to destroy it, spin to attack bomb monsters and collect the gold coins. Try to collect as many gold coins as you can. Besides that, this game also brings you lots of new and interesting experiences such as stomping in the air to break the blocks or doing triple jump to cross high slopes, etc. In general, in this game, all you need to do is reading the signs to get information and control your Mario to overcome all obstacles. There is no time pressure, so, you can experience the game comfortably. However, if you touch enemies, you will lose HP. When your HP drops to zero, you will die. Level Designer is a place on the main menu of this game and it's quite interesting. With this feature, players can create their own levels and other stuff, place enemies, obstacles, tiles, etc. In general, players can create a special level for them in Level Designer. In addition, if they want to publish their own level, they must be a member of Runouw. Use Z to read signs. Spin Attacking by pressing X. Stomp by pressing Z in the air. Read all signs to get hint to overcome the next obstacles. You can play Super Mario 63 full screen to get the best experience. When jumping, you can hold up arrow key for maximum height. Press C to hover upwards. In the right corner of the game screen is the water meter. In case you get trouble with the Z key, let's try pressing ALT + SHIFT. If you get stuck at any level, let’s watch our walkthrough video below to know to how pass. You can customize the quality of graphics in this game by clicking option on the menu screen. There are 4 levels of quality including low, medium, high, and best. Playing game in the best quality of graphics will bring the best experience. Let's spin x when you are falling to fall more slowly. In case there is a creature above you and it is presented in the way of a platform, let's jump up and spin to knock it out. You should stay close to the leading edge of the horizontal moving platforms. This can help you to have more space and time to land back on the platform after jumping. In case you are falling, try to land on your enemies for a bounce. If you are in the water and have turbo Fludd, always use it. There are lots of unexpected traps in this game, so, always zoom out (-) is a great tip to see and avoid them. In case there is a line of coins in some direction, don't hesitate to follow it and gather all of them. When you are in the water, the coin will help you to have more air and health, so, let's spin x to change the fish into coin and grab it. The coin is very important in this game, but, lots of them are in some very difficult location. So, don't try to grab every coin unless you are trying to set a new record for yourself. We can’t deny the attraction of this game. There is the truth that there are millions of players from all around the world and love play this game every day. If you are also one of them and want to play Super Mario 63 Unblocked, Freegames66 is the right place for you. This is a website that you can access anywhere and anytime. Here, you can play hundreds of unblocked games including Super Mario 63, all for free. With a friendly interface and a fast loading speed for all devices, surely you will have lots of exciting moments when playing game here. Now, enter Super Mario 63 unblocked and explore the Mushroom Kingdom with Mario. Play now! When was Super Mario 63 made? This game was made in 2009 and launched officially in 2009 as well. Its last update is on May 18th, 2012. How to beat Super Mario 63? In order to beat this game, let's do follow the tips and tricks above. In addition, when you get stuck, our walkthrough can help. How to save this game? This game is auto-saved. So, you don't have to do anything to save this game. However, remind it only works in case you play this game on only one browser at a certain gaming site such as Freegames66. How to pause this game? If you want to pause this game, let's press button P on your keyboard. Who made Super Mario 63? This game was made by Runouw.